DALLAS – Ten attorneys from the family law firm Orsinger, Nelson, Downing & Anderson, LLP, have been selected to the 2018 edition of The Best Lawyers in America, which recognizes the nation’s top lawyers. Name partners Richard R. Orsinger, Keith Nelson, R. Scott Downing and Jeffrey O. Anderson were all named to the prestigious listing for their work in family Law. Mr. Orsinger was also recognized for his appellate practice and Mr. Anderson earned additional honors for his family law arbitration work. Also earning recognition from Best Lawyers for their family law work are partners William M. Reppeto III, Brad LaMorgese, Lon M. Loveless, Paula A. Bennett and Amber Liddell Alwais. Mr. LaMorgese was also selected to the 2018 listing for his appellate practice. The 2018 Best Lawyers honors are just the latest for the firm, which is celebrating its 25th year of family law service. The firm has more attorneys among Texas Super Lawyers’ listing of the Top 100 attorneys than any other family law firm in Texas. The Top 100 is selected from approximately 87,000 eligible attorneys in the state. Earlier this year, Mr. Nelson, Mr. Anderson and Mr. LaMorgese were selected to D Magazine’s Best Lawyers in Dallas list, and Mr. Downing was honored as a Divorce, Trusts & Estates Trailblazer by the National Law Journal. Among the most respected peer review publications, the annual Best Lawyers in America guide recognizes leading lawyers in various areas of practice. Honorees are based upon peer evaluations submitted by lawyers nationwide. The complete 2018 edition is available online at http://bestlawyers.com. 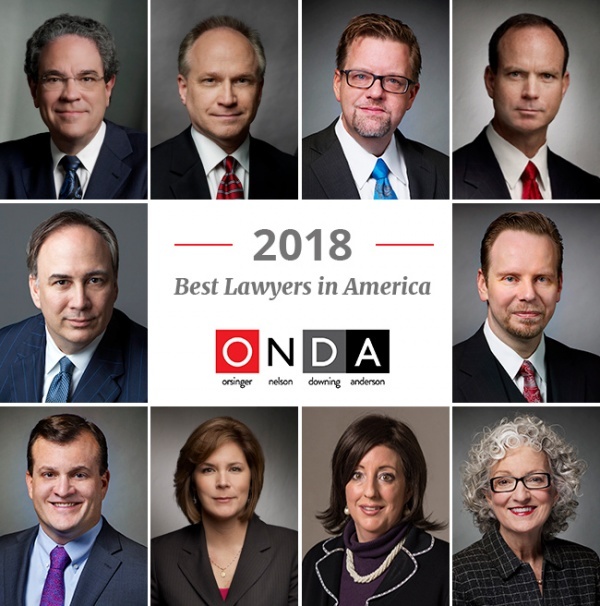 With 16 lawyers and with offices in Dallas, San Antonio and Frisco, Texas, Orsinger, Nelson, Downing & Anderson, LLP, is one of the largest firms in Texas focused solely on trials and appeals in Family Law cases. Four partners are featured on the 2017 Top 100 Texas Super Lawyers list. Every firm partner is a member of the Texas Academy of Family Law Specialists, and all are Board Certified in Family Law by the Texas Board of Legal Specialization. Mr. Orsinger holds additional board certification in Civil Appellate Law.